Private Walter H. Reuter Jr. 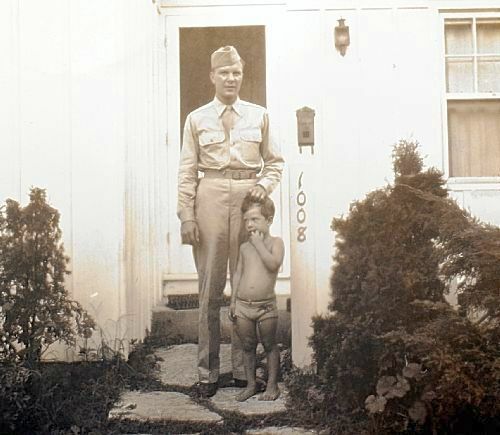 Private Walter Reuter Jr. in 1944 with his son David. The picture was taken right before Private Reuter shipped off to war. Walter Reuter Jr. was born in 1911 and grew up in Pittsburgh, Pennsylvania. Before he entered service, Walter got married, and had 3 children. On January 15th, 1944, he enlisted in Columbus, Ohio and later trained in Camp Blanding in Florida. 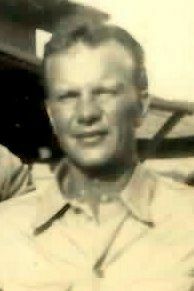 He came home for a week in the spring of 1944, and hosted several parties and enjoyed his days at home in Bexley, Ohio with his wife and 3 children. His son, also named Walter, still remembers his father putting him to bed on the night before he headed off to war and felt really inconsolable that he was leaving. Private Reuter was sent to war, and ended up in Germany. Here he would take part in one of the bloodiest, most brutal battles of the war, the Battle of the Hurtgen Forest, a forest area southeast of the city of Aachen. This often overlooked battle took the lives thousands of soldiers, and lasted 6 months. In October 1944, Company C of the 60th Infantry Regiment took part in the attack in the area of Raffelsbrand. Walter and three other men from C Company (presumably Staff Sergeant Raymond C. Blanton was in this action as well) were ordered to take out the enemy pillboxes (concrete bunkers) in that area. The men were pinned down by heavy machine gun fire and mortar shelling. The fighting went on for hours, and Private Walter, Staff Sergeant Blanton and the other men must have been fighting with everything they had. Unfortunately, none of them were ever seen again. The men were reported Missing In Action on October 14th, 1944. The Army could not search for his remains right away because of continued enemy activity in the area. There were no listings in German Prisoners of War records for Private Reuter or the other men on his mission. In 1945, the Army had still not found the men and a Major General sent a letter to Private Reuter’s wife, Roberta, informing her that her husband was presumed to be dead and on January 8th, 1952, the Army wrote its last letter to Walter’s wife to say it never found her husband’s remains. Mrs. Reuter died in 1999, without ever knowing what had happened to her husband. The improvised memorial that marks the spot where the dog tag of Private Reuter was found can be seen through the trees in the darkness of the Hurtgen Forest. On the right, a closeup of the memorial for Walter Reuter Jr.
Several years ago, Mrs. Nancy Fraker found a picture of her uncle, Staff Sergeant Raymond C. Blanton. She started to investigate his story, and was determined to find the remains of her beloved uncle. In this search, she found out that he was killed near Raffelsbrand in the Hurtgen Forest, in a mission to take out several pillboxes, and went Missing in Action on October 14th, 1944, the same date as Private Reuter. Mrs. Fraker contacted the Joint POW/MIA Accounting Command, called JPAC, and found out about a research mission in the area where her uncle went Missing In Action. In this mission, the Dog Tag, (name ID plate) belonging to Walter H. Reuter Jr. was found. During a visit to Europe she visited the area where her uncle went Missing in Action, and found an improvised monument made by rocks, cement pieces from the former pillboxes and parts of metal. This was made by the man who found the Dog Tag from Private Reuter. Mrs. Fraker decided to find out more, and contacted Walter, the son of Private Reuter about this. 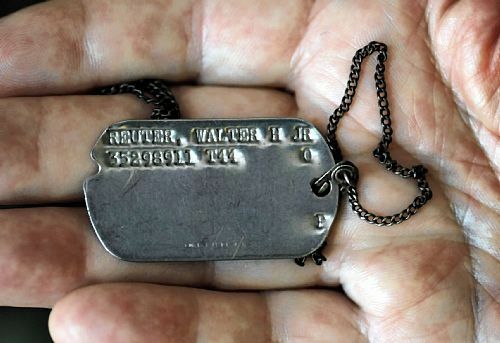 When Mr. Reuter heard about the dog-tag from his father, he could not believe it. After all these years, a little piece of his father’s life could be brought back to him. The dog tag of Private Reuter that was found several years ago in the Hurtgen Forest. It was returned to his son, seen holding it on this picture. Mr. Reuter wrote the man who found the dog-tag, and received a letter back in May 2010, including his father’s dog-tag. He still hopes to visit the Hurtgen Forest one day, and see the spot where the dog tag was found, and his father went Missing in Action. 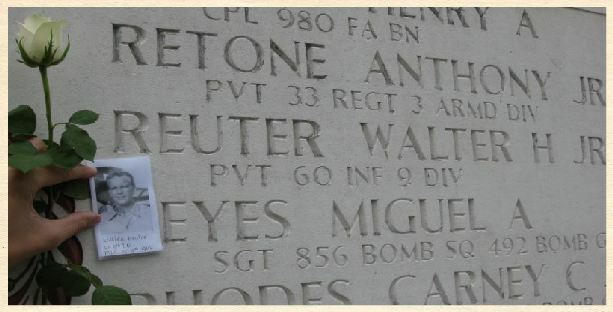 Walter Reuter’s name can be found on the Wall of Missing at the US Cemetery in Margraten, The Netherlands. We will never forget Walter Reuter Jr.